First of all, just look at this cover! Isn’t it gorgeous? To be honest, it wasn’t until I wrote the review that I noticed it. And I fully blame it on my phone. It only lets you see a small picture of the cover, but what a beautiful cover it is! I love how everything fits and most of all I love the font. It totally fits the cover and the story, and what a story it was! 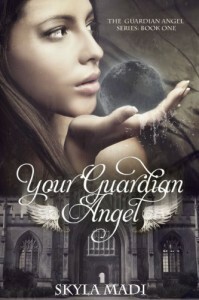 This book will take you to a world full of gods and goddesses, vampires and of course guardian angels. I was quite fond of it actually. It was very refreshing, especially the guardian angels. I’ve never read a story about them before. It’s a well thought-out world and I’d like to discover more. Even if my feminist heart was less happy with the pedestal goddesses were put on and the damsel in distress role they were given. Uhm, they control the four elements. Can’t they use those in a fight? Like throw fireballs at the enemy? Those can be quite deadly, I assure you! Fortunately for my heart there were also female guardian angels who know the ropes and a feisty main character. Who’s gonna chance one or two things, I’m sure. The plot was good too. It has a thrilling start, which kept me on the edge of my seat from page one. It mellows a bit afterwards, which gives you the opportunity to discover the world Skyla Madi created. She also makes sure there’s no opportunity to get bored. Cause the most important piece of information is forever left out, that piece you’ll need to understand the puzzle, to see the whole. Which makes you keep on reading. The only thing that bothered me was the re-explaining of events that happened a couple of chapters ago. It’s like this was a sequel and you had to refresh your memory about what exactly took place. I’m capable of remembering that much, thank you! Life-threatening situations tend to stick with you! 3 HEARTS. A good book with a great world to discover. With an amazing cover and a funny protagonist, who could be a bit too gullible at times. I liked the plot and it’s easy to get lost in this book. Even when Ruby failed to see the consequences of her actions and made not so smart decisions and with re-explaining of some events, like I wasn’t capable of remembering that much in a couple of hours.